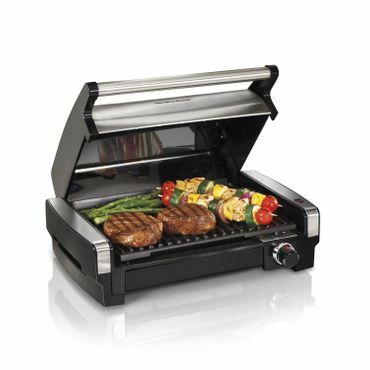 Bottom Line If you just need a small indoor grill, the Hamilton Beach 25360 is perfect. This contact grill eliminates any concern about flare-ups and the hood swings down to help control grease splatter. Sear performance may be a lacking but it locks in flavor and is small enough to tote around for tailgating parties.